When Dak Prescott, Ezekiel Elliot and the rest of the Dallas Cowboys take the field Thursday night, NFL commissioner Roger Goodell will likely be thanking his lucky stars. Because in a season of consistently disappointing ratings for the league, including its marquee games, the Cowboys have been the one real bright spot. Dallas has been in four of the top five most-watched NFL games this year, and five of the top ten, according to Nielsen data. Those numbers might be even more impressive if they had not, due to a scheduling quirk, been absent from ESPN's "Monday Night Football" so far this season. While there has been quite a bit of debate about what's causing the NFL's stagnant viewership numbers, it's easy to figure out why the Cowboys are such a draw. They are of course a perennially popular team -- there's a reason the moniker "America's Team" stuck -- that has won five Super Bowls. And now, after a terrible 4-12 season last year, they're back to their winning ways, leading the NFL with a 10-1 record. Plus, this year's team is more than just that record. They've brought in viewers because they have something the rest of the league is lacking right now: a feeling of freshness and excitement. The Dallas Cowboys have stood out among a season of struggling ratings for the NFL with the league's best record and ratings. 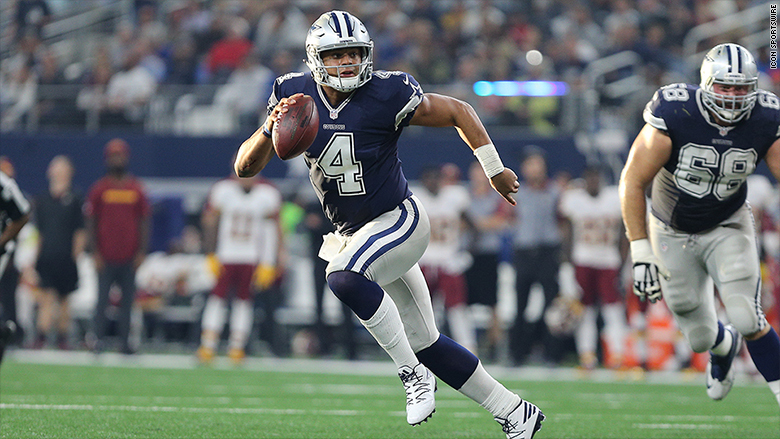 While much of the NFL's star power belongs to mainstays like Tom Brady, Eli Manning, and Aaron Rodgers who have become possibly too familiar to fans, the Cowboys are led by quarterback Prescott and running back Elliott -- two rookies who have become overnight stars capable of drawing in new viewers who'll turn in just to see what the buzz is about. Luckily for the NFL, the primetime schedule for the rest of the season is chock full of Cowboys. NBC has Dallas' next two games, including "Thursday Night Football" this week and a match-up against the New York Giants on "Sunday Night Football" on December 11. And "Monday Night Football," which hasn't showcased the team all year, closes out its season with Cowboys taking on the Detroit Lions on December 26.